I have always loved to sing, play instruments and write music. I took music lessons of all sorts as a teen and even on into college. I’m definitely one of those people who thrives on music, and I felt it was important to pass that along to my children. We have always enjoyed music together, and especially singing. I would sit at the keyboard when they were little and have them match pitches, sing along with me, and we were and still are surrounded by music playing pretty much all the time. My two girls had the opportunity to be a part of a wonderful homeschool orchestra and choir where they learned from an amazing instructor who gave them some pretty advanced vocal training. Recently my 15 year old had the opportunity to be a part of a Christian Youth Praise and Worship Team at our church, and has enjoyed getting some practice using her voice. When the opportunity came up on the Crew to review a vocal training program, I was really excited to try it out with my family! 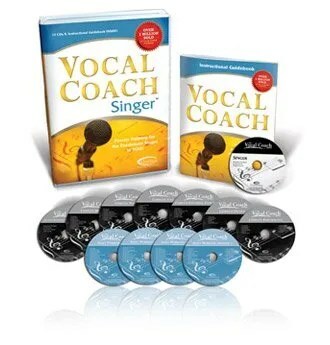 The Vocal Coach offers many products for voice training from beginners to professionals. The founders of Vocal Coach, Chris and Carole Beatty, have been training and coaching singers for a very long time- over 40 years. I was super excited to see their home studio is in Brentwood TN. Nashville is home to us, and also the home of some of the best musicians and music training in the world! Our Crew had the opportunity to review two of their wonderful products. Some reviewed Teaching Kids to Sing for ages 5-13 (retail $44.99). I really would have liked to use this with my 6 year old, because he is very musically talented for his age and loves to sing, but decided since my girls have already had some training, Vocal Coach Singer would better fit our family. It is intended for older students/teens to adults. It is a great fit for the homeschool environment, as it is split up topically, and includes printable personal singer’s journals to track progress. It retails for $99.99 for the MP3 download like we got, or $119.99 for the 12 cd set. So what all does it include? Guidebook- full sized instructional guidebook to ensure success! Personal Singer’s Journal- (Getting Started Journal and Workout Journal) to track progress as you become a better singer! As we were looking through the program, a great discussion came about, how this program not only helps the singing voice, but trains the speaking voice as well. As my girls are involved in public speaking and educational presentations, this program seemed just perfect to increase their skills in using their voices! Wow! This program is even more exciting than I imagined! As I said before, I was super excited to check this program out. We were given the MP3 download form vs. the cd program, so we had a LOT of downloading to do. I knew this might cause problems for us with my country-fried internet limited bandwidth, but I took my chance because this program looked so awesome. Well, I did lose my internet access for exceeding my bandwidth for a short while, but I have to say it was worth it because of all we got with the program. I immediately listened to the getting started file, which went through all of the components of the program and explained what each one was and how to move through each topic. We started by listening to Complete Breathing, then Complete Warm-up. We moved through those pretty quickly, intending to come back and use them more thoroughly and slowly after we listened through the program. The next part we listened to was really cool. Morgan really enjoyed the Complete Tone section. This section really helps you feel what “real sound” feels like. I’m always trying to tell her “sing from your diaphragm, sing from your chest- as opposed to singing from your throat or head. While she understand the difference between singing from your chest vs. falsetto from your throat, this cd has good descriptions of the sensation, the “feeling” of natural voice control. I am particularly interested in expanding my range, and Morgan is to, so we shall see if working through this helps us out! I really expect us to be pleased with the results. I also enjoyed our discussion as we listened through the Complete Diction. I had some stories to tell about my High School Madrigals instructor and how picky he was on diction. So much so that I still think of him when I sing or say certain words! It was refreshing for me to listen through and review many of the singing techniques I learned as a teen from my voice instructor, and have a tool to teach this to my kids. While my girls learned much of this from their vocal instructor a few years back, it’s really amazing to have it for review as well as to expand their learning beyond what they already know. Being older now I think this program will really benefit all they are doing and all they aspire to do with their voices in the future! We will continue working through this program, and as we develop and nurture muscles we never knew we had, I believe our voices will develop and improve beyond what we ever thought they could! This is truly professional grade training. It assumes you are ready to commit and work hard at learning to sing. While it is a wonderful place to start even for beginners, it also has capabilities of taking you to professional level singing. 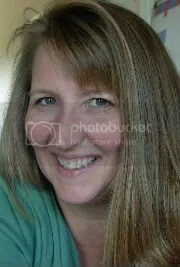 To read about my Crew Mate’s adventures with Vocal Coach products, visit our Schoolhouse Review Crew Blog! ~Disclaimer- we downloaded this program free of charge as members of the Schoolhouse Review Crew for review purposes. No other compensation was received and opinions are my own. Categories: TOS Crew Reviews 2012 | Permalink. Meet our new friends: Mike, Libby, Morgan, Hudson, Kian, and Asher Wild! 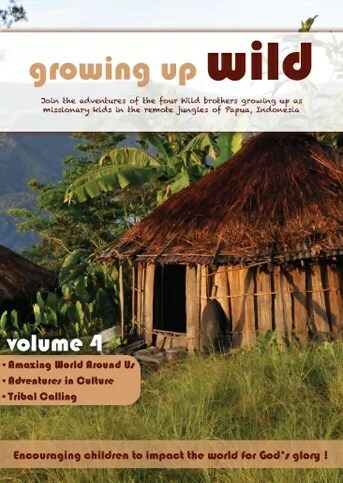 Over the past 6 weeks we have gotten to know this precious missionary family by enjoying an incredible set of DVDs called Growing Up Wild that they made as missionaries in Papua, Indonesia. We have really loved spending time exploring with the four Wild brothers through their day to day lives growing up in the jungle with the Wano people. The videos took about three years to produce, and started with a vision that Libby and Mike Wild had that they might be a tool to influence an “army of future missionaries” that would take the Gospel to unreached peoples in the far corners of the world. 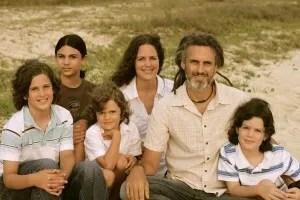 They aspire to educating and encouraging children to the work that goes on in the mission field, and hope that by sharing their family adventures, children might hear a calling to reach out themselves. 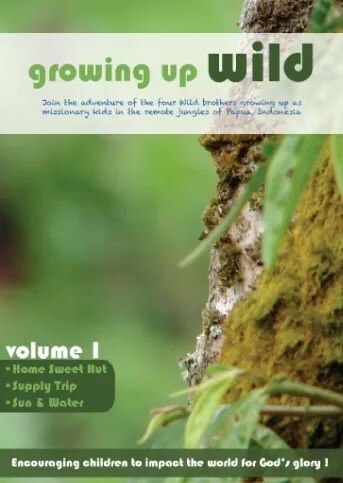 Growing Up Wild is a series of 5 dvds with 3 episodes per dvd. Also included with each volume is a separate activity guide cd for teachers to supplement their educational endeavors as desired. At the end of each episode are also ideas for further fun and educational activities to try out and expand upon. For review we had the great privilege to receive Growing Up Wild Volume 1, $18.99 + sh&tax and Growing Up Wild Volume 4, also $18.99 + sh& tax. 1. Home Sweet Hut~ In this episode you will see a glimpse into the Wild brothers house and life. Learn how a house in the jungle is built and see the creatures that emerge in the night. 2. Supply Trip~ How do the Wild brothers buy and bring in supplies while living in the jungle? Come and watch as this episode takes off on a little bush airplane and ends with a pantry full of supplies. 3. Sun & Water~ Discover how the mighty sun’s power and a rushing mountain stream can be harnessed and become useful daily tools for the Wild brothers and their family. Who knew learning about electricity and water pressure could be so much fun! 1. Amazing World Around Us~ Colorful pythons, tropical birds, a giant stick bug and a huge hairy spider are the stars of this exciting episode. Join the Wild Brothers as they marvel at the amazing evidences of our Creator in the jungles of Papua. 2. Adventures in Culture~ Cultures are fascinating and different for all people groups. In this episode you will follow the Wild brothers’ adventures in culture as they learn about war, hunting, red fruit and nose piercing. 3. Tribal Calling~ In one of our favorite episodes yet, discover how the Wilds knew that their calling was a tribal calling. Find out how icebergs, missionaries and the body of Christ are alike. You may be surprised to hear a calling of your own! Well, Levi is all packed and ready to move to the jungle to be the fifth Wild brother! This dvd series is charming, extremely well produced, well written, inspiring, encouraging, and richly educational. The Wild brothers are absolutely adorable, and the family is fiercely dedicated to their call to share Jesus with the Wano people with all their hearts and souls. The videos are narrated in a conversational style by Mom (Libby) and/or Dad (Mike), and it really feels as if you are right there in the jungle with them. The music really fits the theme and adds so much to the feel of the videos. The short episodes are very complete, sharing one or more aspects of daily missionary life from the houses they live in, to the local wildlife, their trip to get supplies, local traditions and language, games, schoolwork, food, where they sleep, their pets, their ceremonies. In just six episodes (two dvds), we learned so much about mission adventures that we were left wanting more, and ordered the remaining 3 dvds in the series so we had the whole set! I love how scripture is integrated as an important part of their everyday lives, and I especially love their amazing appreciation for nature and how they look at everything as a unique and wonderful creation of God. Levi just loves how these boys get to do so many cool things from playing war with the Wano kids, to discovering snakes, walking sticks, holding their pet parrot, climbing up the incline of the mountain stream to show how they get their water to their house from a bucket filled with rocks for a filter and a hose, and especially their hammocks in their “really cool round house”. I’ve watched him run around the house and our 40 acres in Wild brother style, with his sticks and weapons, pretending to be in the jungle. (Ok, so that’s no different than he usually acts, he just has some new “friends” now to play with, LOL). These dvds have definitely served their purpose in opening up a whole new world of discovery to Levi. He loves to play his guitar and sing praise music, and loves his Lord with all of his 6 year old heart, so this aspect of sharing the Lord really struck a cord with him. I am ever so grateful that the Wild family took the initiative to share their adventures and their life so that other adventurous boys (and girls) like mine might be shown just how we can go into all the world and share the Gospel. These dvds have been such an amazing tool that has opened up conversation and opportunities for discovery for our family of not only how other cultures live, but how those cultures might come to know the Lord, and how some Christians are called to go teach, while others are called to support them in other ways. Levi and I are so very excited to be sharing these dvds with our church family. We are currently making plans to share one episode per month during our Sunday School time with our 1st to 5th grade Buckaroos, and plan to include activities from the educational cd as well as plan traditional snack to go along with it. We can’t wait to get started using these for “Wild Sunday” at our church!! These would make absolutely perfect gifts for homeschooling families and friends! They would also make for a great curriculum for co-ops or other groups, or for homeschool families to get together and share. Ten Thumbs up from this Army of 5!! Visit our Schoolhouse Review Crew Blog to read about my Crew Mates’ Growing Up Wild Adventures! ~Disclaimer~We received these 2 dvds as members of the Schoolhouse Review Crew for review purposes. No other compensation was received and opinions are our own. Categories: TOS Crew Reviews 2012 | Tags: boys, christian missions for kids, elementary social studies, Homeschool, missions for children, Sunday school | Permalink. Primary Arts of Language ~ Learn to Read and Write with Excellence! If you’ve been around homeschooling for any length of time, you have at least heard about Institute for Excellence in Writing. The first program that our family used was their Student Writing Intesive program, as well as Teaching Writing Structure and Style which we had the great privilege to review with the Crew. After this grand introduction to IEW, we fell in love with the company and have used many more of their awesome products. I have been particularly interested in their reading/writing/spelling program for K through 2nd graders for a year or so after running across it on their website, hearing about it from fellow homeschoolers, and then following discussions on the IEW Yahoo group I joined when we first started using IEW products. With a first grader struggling to learn to read in my house, I was just overcome with joy when I found out we had the chance to review the Primary Arts of Language! The Primary Arts of Language program actually comes in two parts, which are best used together. We reviewed both the Reading and Writing portions of the program together. ~PAL Phonetic Farm Folder with Stickers. The reading program uses poetry to integrate the program together. It is divided into four stages: Foundations in which the phonetic rules and sight words are learned using games and hands on activities; Activities where the student plays games daily to master the phonetic rules; Discovery where the student applies the knowledge he has gained to decode individual words presented on Discovery cards; and Library where he gains access to the books in the individualized library. During the Foundation stage the teacher’s time is crucial, and the lessons are expected to be “short and snappy”. The student is not expected to master everything, everyday, but rather the system of repetition grows his knowledge base over time lessening his frustration level. No pressure, no strict schedules, no time frames here. Just plenty of practice and plenty of fun to encourage and motivate your student to learn! I would totally recommend a visit to the PAL product page to watch a very complete introduction to the program by IEW’s Andrew Pudewa, as well as a very well-done and extensive webinar on how to use the program. This is well worth the time it takes to watch it! The second part of the programs is the Primary Arts of Language: Writing Complete package which can be purchased for $89.00 on the IEW website. The writing portion is divided into three parts: printing, copywork, and composition. Spelling is included throughout the course. The goal of the writing lessons is to “lay a foundation for the student to respond to what he reads and hears in writing”. This portion includes a complete handwriting program, as well an an introduction to literature and story analysis with spelling included. Ok, I keep thinking I’m sounding like a broken record as we write chapter after chapter of our Learning-to-Read masterpiece. Maybe this time he’ll get it. Maybe this will be the answer. Maybe this approach will click. For some children, learning to read just “clicks”. My two girls were that way. They began reading before they were four and practically taught themselves to read. Teaching the “rules” and all of the ins-and-outs of reading seemed nothing more than review once they took off reading chapter books around Kindergarten. But then along came my boy who really didn’t care to even learn his alphabet. While he seemed to pick up the phonetic sounds of the letters without much trouble, we seemed to run into the same wall, program after program, formal and informal teaching. The reason? He just wasn’t ready. He didn’t want, or care to focus, and stressing him out, well, just didn’t make sense to me. Making him progress in any of the programs we had started seemed like putting him behind the wheel of the car and turning him loose at 5. He was gonna wreck, and I could see it being fatal to his future. So we continued to work on letters, sounds, basics. Things I knew he didn’t really had no interest in or desire to do, but didn’t stress him out. We kept trying new programs, kept hitting that wall. All the while I tried to stay calm and focused. He wasn’t really “behind” for his age, but outside pressures seemed to heap down upon me, as well as inside ones and I just kept wondering if it would ever happen. When given the opportunity to review Primary Arts of Language from the Institute for Excellence in Writing, my hope was renewed and I became excited and confident this would probably be the answer. I was already familiar with the program from being a part of the online IEW group that I joined when we began our IEW journey a couple years back. IEW has become another cornerstone of our homeschool and a vital part of our curriculum each year. I had been following many discussions of the PAL program, secretly hoping to glean some useful information, but seeing very clearly that this program looked to be just what we needed. The many different facets, parts, jewels of the program from the poems, to the hands-on activities, to the letter stories, to the file folder games sounded like it would hold my boys attention and would allow us to progress as he needed. The second part of my confidence that PAL might just write the final chapter in our learning-to-read story is timing. Levi has seemed much more open and ready to tackle his schoolwork in this fresh new year, even expressing his desire to read, but also sounding things out and recognizing words on his own. So this program, well, it came just at the right time. 🙂 Imagine that. View the Reading DVD with the Teacher’s Manual in hand. This will walk you through the entire program, making it simple to use. Assemble Phonetic Games. This step is optional but will streamline your day by having the games ready to play. View the first section of the Writing DVD. You will watch the remaining portions when needed. Start enjoying PAL with your children! Email if you have questions. So I did just that. First I opened the big bag of the reading part of the program goodies and flipped through it all. Then I opened up the big bag of writing goodies, and then looked through the amazing phonetic farm folder with stickers. OOOOO!!! Fun, fun, fun!! Levi was going to LOVE this!! I put aside the third baggie, because we wouldn’t be needing it for awhile. It contains Level 1 of the All About Spelling program. While the brightly colored phonogram cd rom, cards, student packet and book with the familiarly cute bee buzzing around on it looked ever-so-inviting, I resisted opening it up because I already knew the materials from using the program with my older two girls. I have planned to use this with Levi also, and was delighted when I saw it was a component of the PAL program. And so I began my preparation by popping in the Reading DVD, teacher’s manual in hand. Jill Pike, the creator of this program, does an amazing job at walking the teacher through the program, from how to get started, to assembling the games, to scheduling, materials, to organizing it all. She makes it super-simple to just go ahead and jump right in. I felt like I was sitting beside a good friends showing my how to work through it. I dug out the PAL Phonetic Games book and found the very first game: Letter Stories. I cut the pages out and glued them to the inside of the folder, then put paper clips in place to hold the game cards, which I found in the back of the book and cut out, putting them in a baggie and attaching it inside the folder. Easy! I couldn’t wait to get started!!! But, alas, I needed to view the PAL Writing DVD. The video instruction further clarified just how a day in the life of PAL would look, and just how brilliantly it all fit together, according to your very own child’s needs and progress. I found the student book which is in three parts on the Student Material PDF Files portion of the DVD and printed off the first few lessons. I then saved the book to my desktop for easy access. I went back and put the Reading DVD back in and printed off the first few lessons, also saving it to my desktop for easy future access. From here I was just ever-so-anxious to view the many other “extras” on the DVD including MP3’s about the Blended Sight-Sound Program, Poetry, and even a little video showing Anna Ingham singing/teaching “Robin in the Rain” to her students that is just delightful! I wasn’t able to listen to every program at the first sitting, but I really had a hard time saving any of it for later. It’s just that good. 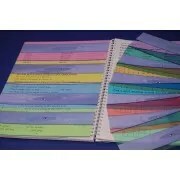 I did the same with the Writing DVD which also has many, many “extras” on teaching reading, writing, little kids, etc. I viewed a couple and it was really like a pep talk from a favorite professor. The support and encouragement that comes with these programs is nothing short of phenomenal!! I feel the need to apologize at this point for those of you who are still reading this lengthy review, but I hope I’m getting the point across here about how perfectly amazing this program is. This program is for all learning types, all stages of learning to read, all frustration levels, and any kid who likes the “fun” approach. It’s for all kinds of teachers, especially those who like something spelled out, easy to follow, and mostly already done for you. Best of all, it comes complete with the encouragement and pep talks. It’s all in there! So what does a day at Gunn Ranch Academy’s PAL Adventures look like anyway? We start with Levi rolling his little cart-of-magic drawers over, and after digging out the PAL Reading Teacher’s Manual and opening to the current lesson, we start with a poem. The poem used in the first 10 lessons is called “September”, and we read and discussed it from many different perspectives. I LOVED hearing Levi recite this poem (honestly something I NEVER thought I’d hear him do!!). This part usually lasts around 5 minutes. Next we move to the Class Journal, Printing and Story Time. The instructions are to make an entry into your class journal (further suggestions are discussed in the intro to the book and throughout the process). For this we were already using a program in which we made daily entries, so we continued that. Next we look back over the pages of sentences and reading practice sheets we accumulated in a binder notebook from previous lessons, reading what we can and avoiding frustration as needed. Next, I set aside the Reading manual and open the PAL Writing manual to the current daily lesson and begin following through it. Here is where the letter stories are introduced and writing practice happens. This usually takes around 15 to 20 minutes, followed by a story which is printed in the Writing manual. These are short stories such as Goldilocks, Little Red Riding Hood, or an Aesop’s Fable. This takes another 15 to 20 minutes as we read through and use the Story Sequence Chart to discuss the story. Sometimes Levi gets frustrated when it becomes a bit too “academic” and so try to just have fun with this part. We usually take a bit of a break here if needed for bike riding or such, and I work with another child if he seems to need one. Some days he’s ready to move on, though. When we resume our adventure for the day, we move back to the reading manual for “Foundations and Reader Words” time: aka game time. The manual instructs which games to play and what to add. At this point we are still working through all of them. First he matches little letter cards with the same letter on the game board as he says the sound and slides it into the paper clip. After all the letters are matched up, we take them off and put them back in the baggy and get out Mugs. Mugs is a dog with a cut-out mouth where Levi can feed him bones that have letters on them . Once he picks up the letter from Mugs’ dish, he says the sound or sound combination and feeds the bone to Mugs. Once all the bones are gone, we put the bones back into the bag for the next day and move onto the Painter’s Palette where Levi matches the color word with the color splotch on the palate. After putting that one away, we get out the Letter parking lot where he parks the cars with vowels on them in one lot and the consonants in another lot… and so on. Some days we use 3×5 cards that we create throughout the lessons with sight words, animals, colors, etc on them to play additional games. Once the games are all done, we move on to the Phonetic Farm which is a tri-fold card folder farm scene that we stick “phonetic” stickers onto to create the whole farm. This is a really awesome little tool that Levi really loves! Moving on, we spend 20 to 30 minutes on the printed student work pages. Students can work on these alone once they get older, but we still work on them together. They have coloring, cutting and pasting activities and activities that re-enforce the daily helpers, sight words, homophones, etc. Here is where our lessons end and we take a break before moving on to other subjects. At the end of the afternoon we try to go back and tour the Phonetic Farm (sometimes we wait for Daddy to come home to share it with him if he’s not working late or out of town! ), play the card game again (we don’t usually do this as review, though, because it stresses Levi out when he can’t remember and I want review to be “fun”), and do an “informal” spelling test of the letters and/or words we’ve learned so far. Right now this includes me saying the letter sound and him writing it on our white board. He also likes to tell me the letter story with the letters he writes. Sometimes we include a review of other activities or games we played or other things we learned or talked about, but keeping the review “short and snappy”. We are progressing through the program amazingly well so far. I’m not rushing Levi, and have found much of what we are doing a pleasant review. But I am also seeing things “click” that really didn’t before. I’m seeing his focus and attention much better, and when he is not able to focus, it’s really easy to take a break right where we are and pick it back up once he has a chance to let off some energy. I love how the program has so many little steps, many different parts that fit all together so that it may be done in small bites at a time, adjusted accordingly. As we get further in to the program, I am enjoying listening through more of the MP3’s, reading back through the wonderful introductions in the manuals which give TONS of information on teaching reading, writing, and teaching in general. I’ve enjoyed learning more about where this program came from, and the blended sight-sound program. I had heard this spoken about when we started our other IEW writing program for the older kids and it sounded really interesting then. I love how there is so much information included to keep encouraging and helping and holding your hand all the way to success. I’m looking forward to seeing Levi’s confidence in his reading skills as we continue to progress through this program. It’s really just the best thing I could ever imagine teaching reading and writing with! Highly recommended for all learning types, all learning methods, and anyone who wants to give their child a solid foundation in reading and writing! For more Crew adventures with Primary Arts of Language, visit our Schoolhouse Review Crew Blog! ~Disclaimer~ I received these products as a member of the Schoolhouse Review Crew for review purposes. No other compensation was received and opinions are my own. Categories: TOS Crew Reviews 2012 | Tags: blended sight-sound program, early readers, early spelling, Early writing, IEW, Reading, struggling readers, Teaching reading | Permalink. My family LOVES to visit bookstores (because of course it fuels our passion for books!). I especially love to hang out at Christian bookstores, and since our schedule is so crammed full, online bookstores give me a place to explore and discover as I’m trying to relax and unwind in the evenings, or sometimes in the wee hours when I can’t sleep. 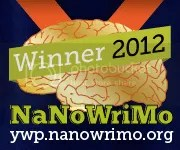 So I have this amazing little online bookstore I’d love to share with you. When I read the name Beloved Books I immediately concluded that it must be a wonderful place full of discovery. I clicked over to the website and my first glance over some familiar, beloved books told me I was right. I had discovered a JEWEL of a place! The store was created by a Christian family who wanted to share and make available some of the favorite life-affirming, wholesome literature that has touched their lives. While they love reading books together, they also love listening to audio resources. One of their main missions as a family is to share the fabulous Sugar Creek Gang audio series with folks worldwide. They believe that this series of audio cd stories has had an incredible life-changing impact on young people everywhere. 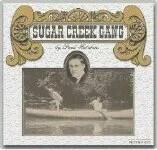 I’d heard of and seen the Sugar Creek Gang around, but my family has never experienced it for ourselves. After reading what a powerful ministry it is, I was eager to receive the Sugar Creek Gang Volume 1 cds to review! We received a neat little case full of 12 cd’s containing 5 stories narrated and produced by Paul Ramseyer in the studios of Northwestern College Radio from the original book series by Paul Hutchens. This evangelist who graduated from Moody Bible institute and preached all over the world, found his gift for writing in 1939 when his first Sugar Creek Gang book was published by Moody Press. The complete 36 book Sugar Creek Gang audio series has been made available on 72 cds put together in 6 volumes that cost $54.95 each or currently on sale for $279.70 for the whole set. The Volume 1 cd’s like we received currently have free media rate shipping too! Also, you can purchase the first 2 hour story with free shipping for just $4.95 if you just wanna check it out, but I’m telling you, you’ll want more once you hear it!! So what stories did we get to listen to on the Volume 1 set? And just what is so amazing about these stories- after all aren’t they old and boring, especially since they were written so long ago? Oh man, let me tell you they are anything but boring. I have to admit that thought crossed my mind; I too wondered if my busy, can’t-sit-still, wiggly boy and rather-be-outside girls would sit and listen to these. Especially since we don’t spend much as much time in the car traveling as we used to. But once we popped the first cd into our cd player and began to listen- we were hooked. The narrator’s voice is fabulous and changes with each character. The stories are totally engaging and leave your imagination soaring. I was completely blown away by how they include Biblical principles, scriptures, poetry, lots of good character and sound moral principles- while making them look “cool”. As I was listening and watching my 6 year old son completely entranced and involved in the stories, I just couldn’t help but be totally thankful for this amazing example. I have to fully agree that this is a worthwhile and WONDERFUL ministry to share with kids! I’ve already let you in on the fact that we LOVE and have befriended the Sugar Creek Gang here at Gunn Ranch. But I must elaborate a bit more. When my girls were younger we spent much more time in the car traveling, and especially during our active duty Army years. We are a very literature-thriving family, much like the family over at Beloved Books. We love to immerse ourselves in read-alouds, and old time audio programs alike. But once Levi came along and then we got busy with our ranch, we seem to spend much less time cuddled together reading, and more time outside. This is not a “bad” thing, but it just means that I really need to make our literature-time count. Levi is a much tougher customer when it comes to the patience to sit still and listen. He listens more out of obedience than the joy of the adventure many times. That’s not to say he doesn’t like a good book, but I definitely have to pick and choose more carefully to gain his full attention and engage him. I wasn’t sure how I was gonna accomplish him listening to hours of stories. That’s a long time to sit still. Alas, I found out early in the game I had no worries. I popped the very first cd in the player in the truck on our drive to the city. Once we arrived at our destination (the dentist’s office :)), he was disappointed we had to turn it off. We talked about the Sugar Creek Gang boys while in the dentist’s office; we discussed each character, and the who he thought the swamp robber might be. Once we loaded back up into the truck, I had ejected the cd because we were running a few more short errands before the trip home and I hated to keep interrupting the story. Levi kept asking and asking for me to turn it back on. He was a happy camper once we were headed home, and when we got home he took the cd inside and popped it into the cd player where we finished listening to the story. Each chapter of the story is divided into separate tracks on the cd, so you can stop at the end of one chapter, and/or listen one or two chapters at a time. The end of each chapter is repeated at the beginning of the next for a refresher of what is happening, which is helpful when listening a chapter or two at a time. That evening I found Levi and Taylor snuggled in her room listening to the next story, and for several days after I could find them in there laughing and spending time with their new friends. Levi began to refer to the stories and characters daily, and was excited to tell me all about the adventures he had heard about. Levi’s favorite character from the Sugar Creek Gang is Big Jim. He likes Big Jim because “he can do almost everything. He can make a tourniquet if someone is bleeding and keeps all the boys in line. He was strong, could tie all different knots and could do anything”. (I love Big Jim because his number one rule was to not cause any of their parents to worry.) 🙂 Levi then described how he liked each of the other characters as well: Lil Jim, Dragonfly, Poetry, Circus and of course Bill. I love how the stories share good morals of everyday living; Bill was worried about getting his overalls dirty! The stories are examples of wonderful family values, and great adventure. The “gang” of six boys are wholesome, fun-loving, adventuresome boys who try to do the “right” thing and obey their parents, yet have the adventures, temptations, and boyish ideas of “real boys”. The boys have very real emotions, they wrestle just like boys will do, and share the same questions and curiosity our boys have. Bill (the boy narrator) refers to getting “lickins” and even talks about how he was glad his parents cared enough for him to keep him in line. I loved in the Winter Rescue how Bill describes his little baby sister as she was teething and a bit fussy. There are so many great references that kids can relate to from growing up in a family. There are many, many lessons from nature and everyday “science lessons” such as descriptions of all the different types of dog tails, animal instincts, insects, thanksgiving turkeys, compasses, fishing, etc. It’s amazing how so many lessons of all types are tied into the story! There are many references to Boy Scouts for those who are scouters! There are elderly characters that the boys interact with, and there is much respect and many lessons to be learned from them. This is a great tool for showing young people how to interact with elderly people and adults. I was a bit surprised at the references to one of the boys in the gang as “fat” and “big”. But this was not malicious or making fun of him, it was just a character description, and never used to make fun of or in a sarcastic way. As we were listening through the stories, the detailed descriptions of the kids as “having teeth to big for his face, but they will look normal once his face grows,” and other descriptions from Bill’s point of view became part of what makes the story honest and imaginative. There’s just nothing more delightful to my momma-heart than to hear Levi refer to good morals, good manners, Biblical scripture and evening reciting poetry in a fun and confident manner. This is such a great way to build courage, wholesome imagination, and character in God’s little ones! And I totally enjoy listening to these myself. They are simply delightful!! If ever I pop a Sugar Creek gang cd into the computer, it’s not but a minute that Levi is snuggled up listening. As with all great literature, the characters have become friends of our family. That speaks volumes! I am planning to budget the rest of the cd’s in at some point. These would make fabulous gifts! Check out my Crew Mates’ adventures with the Sugar Creek Gang over at the Schoolhouse Crew Blog! ~Disclaimer- we were given this set of audio Cds as members of the Schoolhouse Review Crew for review purposes. No other compensation was received and opinions are our own. I haven’t really explored many special-needs or learning-aid websites in the past except a few accelerated learner resources. But with Levi being a little slower to mature into his reading comfort zone, I have begun to notice tools and tips that help with this important venture. I’ve pondered whether we might be dealing with dyslexia, but have found that he really doesn’t have the typical signs of dyslexia. And while he hasn’t seemed to grasp the concepts and reading skills as quickly or early as his sisters, he is actually right on track, if one cares to stereotype such a thing. I believe that all children develop on their own individual schedules, and only really excel if allowed to follow God’s plan, and not be stuffed into the world’s ideals. But that’s another topic, and what I’m really here to do now is to tell you about a really cool company that offers some amazing learning aids including some awesome reading rulers that have really helped Levi stay focused on his reading. Crossbow Education is the website, and they are indeed dedicated to creating a positive learning environment where your child, labeled, unlabeled, or indifferent can excel and achieve the excellence that you desire for him. They are passionate about helping children and adults who deal with dyslexia and special needs. Their goal is to help identify dyslexia tendencies and provide tools to aid in everyday tasks. Their reading rulers are some of the best selling products, and are currently used in many schools in the US and UK. They have several types of color overlays, but their most popular ones are the Eye Level Reading Rulers. We got a chance to see how these wonderful tools work! The pack of ten Eye Level Reading Rulers is currently on sale for $16.95. They can be used for any age, and are especially great for beginning or struggling readers. We received a pack of 10 duo window rulers, one of each of these colors: yellow, celery, grass, jade, aqua, sky, purple, magenta, pink, and orange. They suggest that you test read with all of the colors, then choose the one you feel most comfortable with by laying them side by side in turn on a piece of text and then choosing the one that is clearest. You may find a favorite that you stick with or change preferences day today depending on lighting, mood, and the material you are working with. They also recommend to keep similar complimentary colors apart, and that you should test in the order of pink,, celery, sky, magenta, grass, yellow, aqua, purple, orange then jade. These reading rulers have two windows, one is 1/2 inch and one is 1 and 1/4 inch wide. The narrow window will take one like of big text and two of small text. Early readers like mine seem to prefer the focus to be confined. The rulers can actually be trimmed to fit in books, or such. As for Levi, these have really helped him stay focused on his lines as well. While it might just be the novelty, the pretty colors he likes to choose from, or the hands-on effect it brings to his lessons, it doesn’t really matter to me as long as it’s helping him stay focused and interested. We keep them in the package in the top drawer of his work cabinet, and he loves to pick out which color he and I will use when we are reading. I haven’t really seen a preference in color as I expected I might. We went through the color progression at first but now he pretty much just chooses a color of the day. These are also really helpful to my middle student when looking up words in the dictionary and thesaurus. She like using them as well. I really love the fact that we have ten of them and I can keep a couple of my favorites as bookmarks in some of the texts we read together from. The rest stay in Levi’s top drawer of his work cabinets for easy access in their little plastic packet to keep them from getting scratched up. Click on over to the Crossbow Education website to see these and many other cool products they carry! And don’t forget to check out my Crew Mates’ adventures with Crossbow’s Reading Rulers over at the Crew Blog! ~Disclaimer- we were given this product as members of the Schoolhouse Review Crew for review purposes. No other compensation was received and opinions are my own. Divin’ Into the Deep Blue Bible! Oh boy have I got something AWESOME to share with you!! If you’ve got kids ages 7-12 who love to read and love adventure, then why not send them on the trip of their lifetime with Asia, Edgar and Kat through the greatest adventure of them all: God’s Word? The Deep Blue Kids Bible contains the full Bible in the Common English Bible translation– a balanced and readable translation, clear and easy enough even for your littles to understand. This Bible is tailored specifically so even the youngest readers can engage and get fired-up about God’s Word in a full-color illustrated format including detailed notes, trivia, memory verses, devotionals, and fun activities and ideas. What better way to learn to read? This unique children’s Bible, which retails for $26.99, comes with various cover options that can be seen on the purchase page where you will also find the links you need to purchase one for your little adventurer. Here you will also find a couple of other resources offered by Abingdon Press that were created to compliment your study adventure. The Deep Blue Kids Bible Website has lots of other cool resources, videos, and samples you can check out! 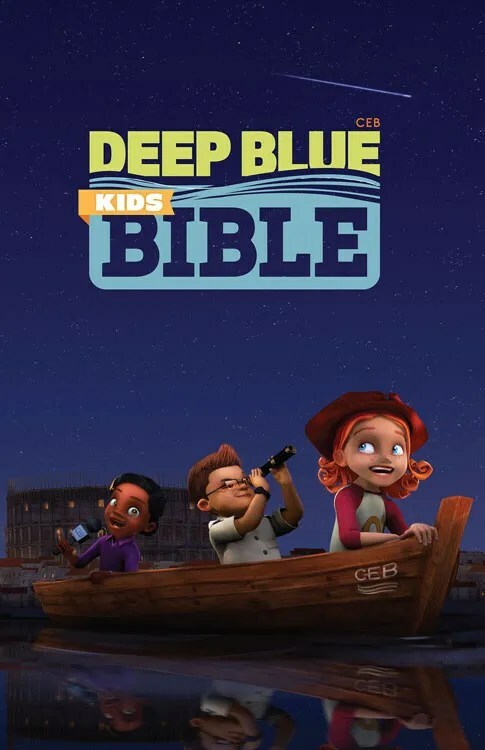 So what’s so different and cool about the CEB Deep Blue Kids Bible anyway besides the great new translation? Gunn Ranch Academy Dives In Deep! I remember searching for the perfect Bible for Morgan when she was a baby, a preschooler, and then again when she first learned to read when she was 4. I then remember looking around again as she began to question and want to really understand what the Great Adventure was all about in her own language in her tween years. I found a really cool Bible for her that she loved and learned to use and depend on. I also remember that day at Church camp last summer when she realized she had outgrown it. As our kids grow through different ages and stages in their lives, I believe having a version of the Bible that fits their needs is really important. Each one of my children have asked for a Bible of their own at different times and stages in their own lives, and we’ve gone on searches together to find one when they did. From the time Levi was a wee tot he has loved to carry his Bible to church. From his beginner Bible to his special “boy’s” Bible, he will sit and open it up to explore even though he can’t read much of it for himself yet. When the opportunity to bring a new and exciting illustrated Bible into our home presented itself, I felt blessed, excited, and positive he would have a brand new friend to carry around! From the time I opened up the package and first saw the cute cover and flipped through the pages, this Bible looked inviting and definitely fit the ticket for a new adventure. The characters featured throughout are introduced right on the very first welcome page. The translation is a joy to read, and I’ve enjoyed it as much as Levi. It feels like I’m sitting listening to Paul and the rest of the gang telling me a story. I guess you would call this a “conversational” narration, but still recognizably familiar as many of the other translations I love to read and compare. I love reading and appreciating different translations, and this one could certainly be one of my favorites from what we’ve studied and read so far! Levi LOVES LOVES LOVES this Bible. I just knew it would be a favorite of both 12 year old Taylor and 6 year old Levi because she loves to read to him. This is a treasure they will share together for quite awhile. My favorite parts are probably the God’s thoughts/My thoughts that expand upon and explain chosen passages and stories and include thought provoking discussion questions. I also love the Did You Know? sections that highlight historical facts and details from the scriptures and stories. There is a great little dictionary at the end of the book along with a section called “I Wonder What to do when I’m…” that lists feelings/topics referenced by scripture verses to look up. I love when Bibles include this, and especially kids Bibles because it turns the Bible into a useful tool; a place you can go for the answers; THE place to go for answers! This Bible gets ten thumbs up from my Army of 5. It will be at the top of my gift list for elementary age friends and relatives, and I know ours will definitely be well used and well worn at the ranch! Check our the Schoolhouse Crew Blog to read about my Crew Mates’ Adventures with the Deep Blue Kids Bible! ~Disclaimer- We received this Bible as members of the Schoolhouse Review Crew for review purposes. No other compensation was received and opinions are my own. Categories: TOS Crew Reviews 2012 | Tags: children's Bible, Common English Bible, good kids translation Bible, Kids Bible | Permalink. The National Tax Training School has been one of the top distance tax preparer schools in the nation since 1952. This licensed and nationally accredited program educates people with no previous tax or business experience to be trained, competent, and registered tax preparers in as little as 8 to 10 weeks. No pressure, though. They let you take up to a year to study and complete the 20 fact-filled lessons with help and support from an individual instructor as needed. ~The Federal Income Tax Course which trains even those with no prior tax training to prepare tax returns for individuals and small businesses. After receiving your certificate of completion, you should be fully qualified to take and pass the Registered Tax Return Preparer (RTRP) examination required by the IRS, and be ready to set up your own income-earning Tax Preparer’s Business! 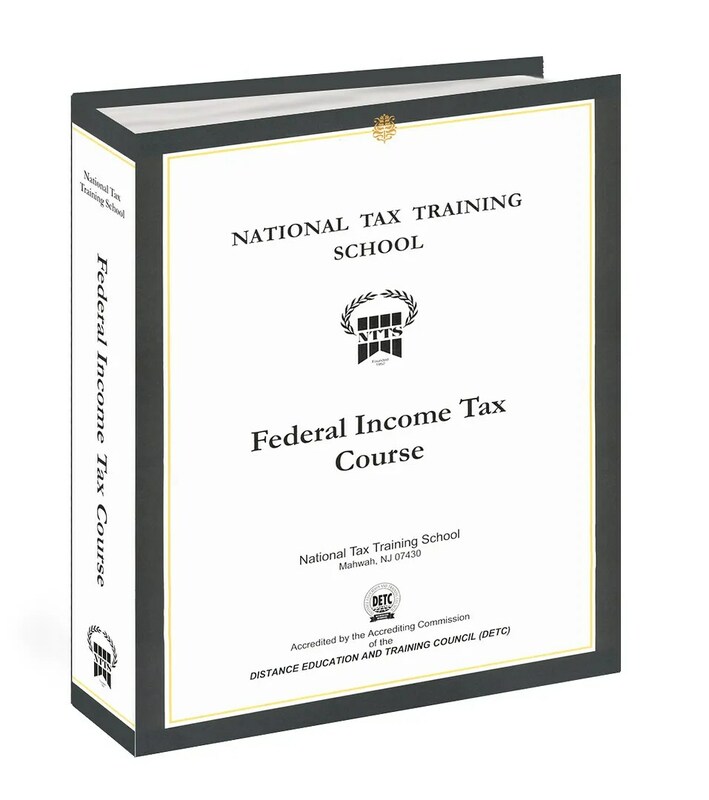 ~The Higher Course in Federal Taxes is a more advanced course for Tax Professionals. It trains you to prepare taxes for partnerships, corporations, and fiduciaries and prepares you for the IRS Special Enrollment Exam. ~The California Tax Preparer Course, as you may guess, trains those wishing to prepare taxes in California for that state’s special requirements, and upon completion of the course automatically qualifies you for your California Tax Preparer’s License. For review our Schoolhouse Crew was offered the opportunity to take the complete Federal Income Tax Course which retails for $495.00 with two years post-graduate support or $795.00 with 4 years post-graduate support. We were asked to consider that the suggested time for each of the 20 units is 8 hours to fully read, study, take the practice exam, then complete the exam for mailing in. While we were not expected to complete the full course in the 6 week review period (or less depending on when the package actually arrived at the reviewer’s homes! ), we were asked to complete as much as time allowed to get a good feel for the program, and then continue to complete the program at our own pace so that we could be prepared to take and pass the RTRP exam and be working tax preparers if desired. As I considered my busy schedule, I also thought about my long term desire to know and really understand more about income tax preparation. As I have looked into starting my own business in the past, my lack of business education and, in particular, not understanding how the tax laws would effect it all have greatly deterred my progress. I felt I could certainly dedicate at least 8 hours a week to studying. When my first box arrived in the mail, it contained a nice, thick binder containing the Federal Income Tax Course Assignments 1-20. After a few weeks into the course, I received another package containing the Final Examination, Certificate Order Form, and a packet of Practical Case Studies, Guide to State Personal Income Taxes, and an IRS Licensing Information Bulletin on registering to take an Enrolled Agent Special Enrollment Exam. Also included was a softcover step-by-step guide entitled Building, Marketing & Operating a Profitable Tax Practice, and the RIA 2012 Federal Tax Handbook. Normally in the course the second package is mailed after you complete your 17th lesson. They provide a form to send in to receive it. The purpose in waiting on this portion is so that you may have the very newest and updated tax information. We also received access to an online version of the program complete with practice exams as well as the actual lesson exam that can be submitted online instead of mailed in. Check out Income Tax Course Outline to see all of the specific topics covered. It’s a very complete course! I was pretty nervous to receive this course after making the decision to commit the time and priority. But I have always really wanted to understand and learn more about taxes, and particularly business taxes. My schedule this time of year is super busy with County Fair prep, including our County Horse Show. 4-H is a huge part of our family and fills up our calendar fast once the school year gets up and going. After much consideration, I decided I could at least commit 8 hours per week to studying, and then maybe more once our schedule allowed. When I received this course, I was pretty excited to begin reading through it and getting started. But just as one of the recommendations was to set aside a quiet place and definite time to study, I figured out pretty quickly that I must indeed have a quiet place, uninterrupted to be able to focus and concentrate. While this is interesting material, it’s also a bit dry and every page is just packed to the gill with information. It’s a bit overwhelming for a scientific mind to process a business tract program, and an impossibility in the midst of my noisy, busy, household and ranch. Back in the day I was able to study late night hours, but found that doesn’t work so well with my current lifestyle (Ok, I admit I’m getting old). I fell asleep the first several times I tried to take advantage of night hours. 🙂 Early morning hours didn’t work too well either and I just couldn’t really set a scheduled time. My schedule has ended up working better in blocks doing several lessons at once (so far). It took me awhile to get through the first lesson and be able to focus so I could get through the practice test, but once I was finally able to settle in and just do it, I didn’t have any problem going through the test. After completing the test, I put it in the envelope provided and added the postage. While I was in the groove and had the quiet time available I went ahead and completed another lesson and exam and got it ready to mail out as well. I felt a bit of excitement as I mailed my first exams off to be graded! It took a little over a week for me to receive them back all graded and I got two A’s and and A+. (I had time to complete the third lesson the very next day and mail it off, and got them all back together:)). Now that I have gotten started pretty well I have been able to carve out more time to study and focus. While I certainly won’t be finishing the short course in 8 weeks, I can definitely see that is a very real possibility for someone with the time and dedication to make this a priority, and a business could be opened and earning income in just a few short months. For me, I’ll continue at my have-time pace and will complete the course probably within 6 months or so at least. I have learned quite a bit about taxes from the very first lesson that I really didn’t know before and so much has been clarified for me. While I understand this information is readily available, it’s summed up nicely and accurately in this material and very easy to read through. I totally believe this would be a real consideration for anyone wanting to start a business on the side to make extra money and provide a valuable service in their community. It really is worth the time investment and a I believe anyone willing to invest the time and attention could excel and become a trained tax professional using this program. Even if a business venture is not on your plate, this program is worth the information alone to be able to really understand how our income tax system really works, and knowing the ins and outs can certainly be to your advantage as you part with that hard earned income. It will be nice to have the peace of mind knowing I’m not having to give more than my fair share of money away. If you’re looking for a side job, a regular job, or to further your knowledge of income taxes, this is a great course for you to check out! Be sure to check out my Crew Mates‘ Adventures with National Tax Training School over our our Schoolhouse Blog! ~Disclaimer- I received this complete course as a member of the Schoolhouse Review Crew for review purposes. No other compensation was received and opinions are my own. Categories: TOS Crew Reviews 2012 | Tags: home businesses, income opportunities, Income Tax, jobs, Tax Preparer courses | Permalink.